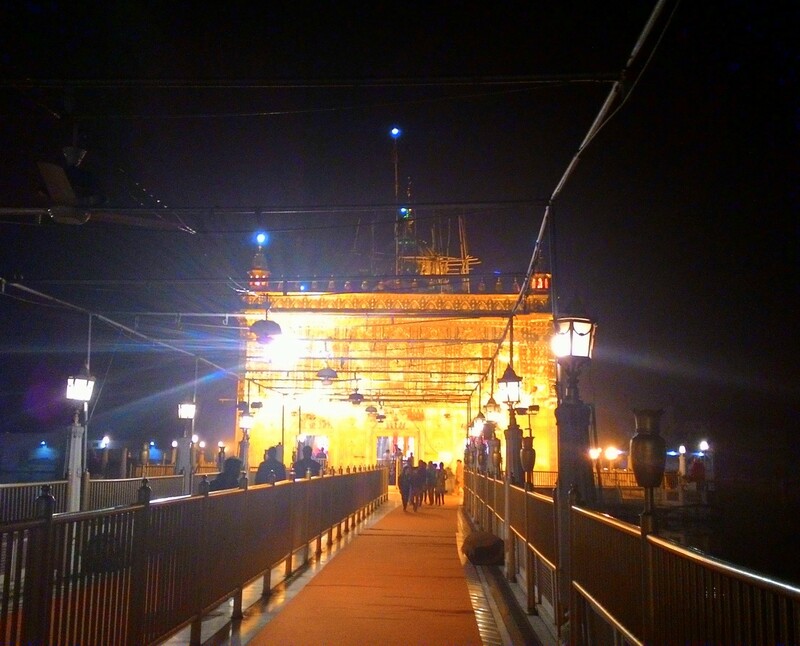 It was a perfect beginning of my Amritsar journey. This early morning around 6:30 am when I just woke up, my train was just about to reach the station when the famous Punjabi Bhajan “Ek Omkar Satnam” was played around. 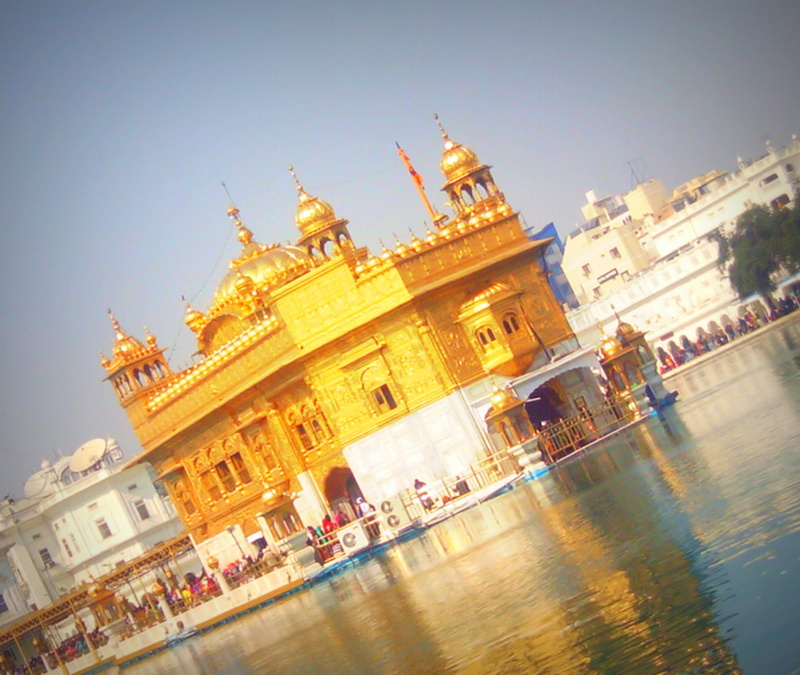 THE GOLDEN TEMPLE!!! I remembered few days back, when I picked the newspaper and on reading an article posted on golden temple, how badly I wanted to visit this place, and 7 days later, I was here. We reached the station around 8:00 am and went to the Deep Singh Darbar Gurudwara where our stay arrangements had been done by our Association members though which I was travelling. After half an hour of struggle we got a room at the 4th floor. This is how it looked. We were 8 of us in one room. View of the Deep Sing Darbar Gurudwara from the Balcony! 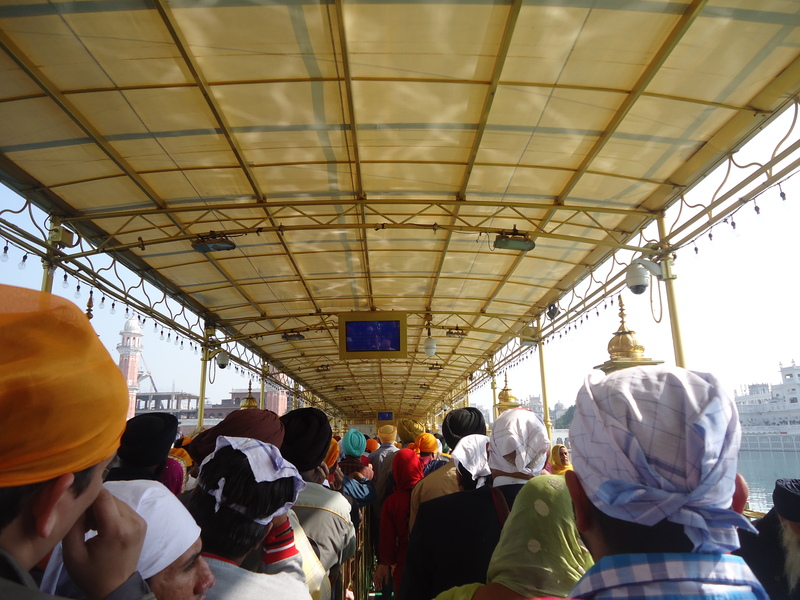 We were ready by 11 am and after visiting the Deep sing Darbar Gurudwara took a rickshaw for the Majestic Temple. The walk to the temple is through the Bazaar which is good for shopping. The very well known Jallianwala Bagh also comes on the way to the Temple. No words can ever explain the experience on getting the first sight of the temple. I was spellbound and went to another world on reaching this “Abode of the God”. Truly the most spiritual place in the country. The peace in the atmosphere, that feeling of contentment on people’s faces, the reflection of the temple in the water, the long queue towards the temple, the combination of white and gold, it was all majestic. We left our shoes in the facility of the temple; washed our feet by walking through the stream of water and wore the compulsory headgears. You can get the Bandanas from the temple or purchase it from the shops there. 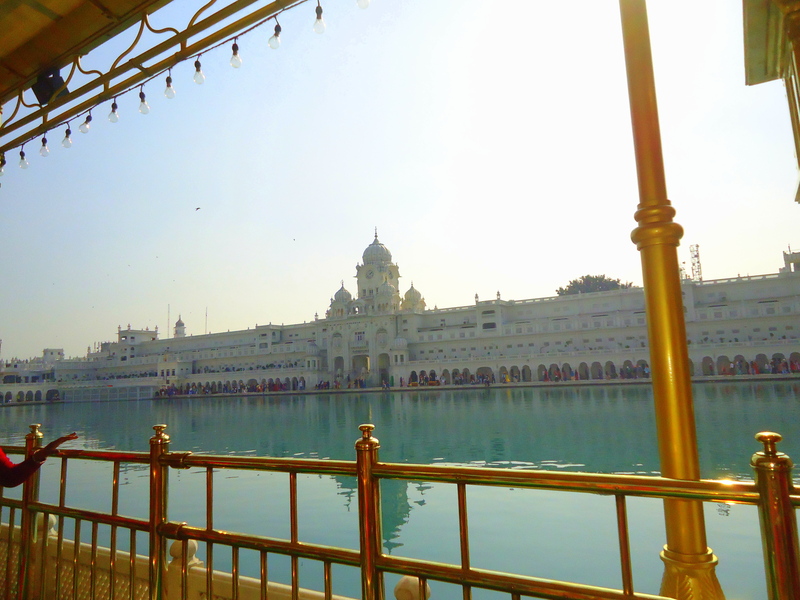 We then entered in and saw the divine temple, also known as Hari Mandir or Darbar Sahib which is surrounded by the large pool of sacred water known as Amrit Sarovar (Pool of Nectar).One has to reach the temple by doing Parikrama of the pool in a clockwise direction. Another part not to be missed here is the “Guru Langar” which happens to be the largest free eatery of the world, feeds more than 100000 devotees daily. Each devotee gets a wholesome meal served by the volunteers. It is a huge dining hall where everyone sits on the floor regardless of the caste, culture, status , wealth etc. We finished the langar, Our group of 8 broke and had to spent time in looking for each other, it was 3 pm already and we had to reach the Wagah Border. We hired a taxi and reached the Border exactly when the parade started. On realizing we could be late and the gates might close, all 8 of us ran to our best and were scattered. I took the stairs and got a place good enough to get a sight of the Parade. The Indian side was jam packed, while only few Pakistanis cheering. It was one mad rush and one of the craziest thing I ever witnessed. 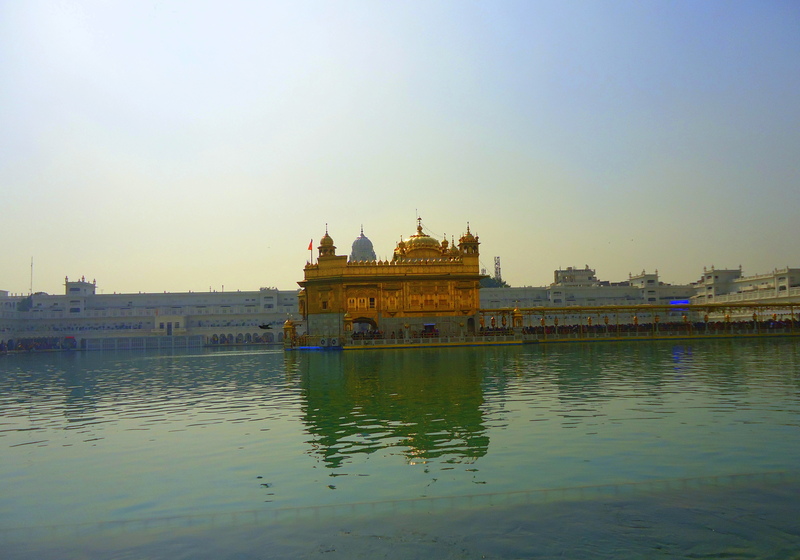 1) The Golden Temple :- Try to get in early morning or night, though the temple is open 24 hours. I wish to get a night view of the temple on my next visit. 2) Jallianwala Bagh :- I missed this due to time constraint. This is just near to the Golden temple, can be taken up before or after visiting the temple. 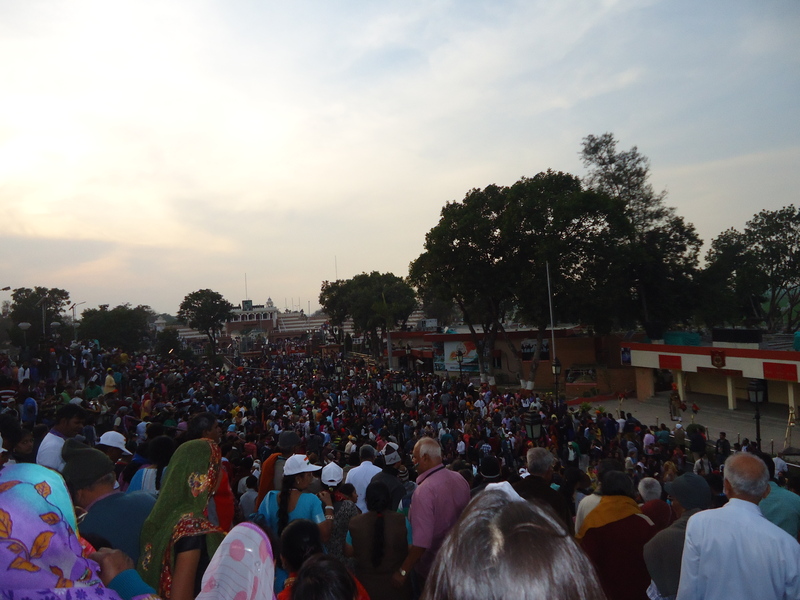 3) Wagah Border :- It is 35 km from the city. Make sure to reach on time to get good seat, any day of the week is always crowded. Reaching by 3:30 is advisable, the parade starts after 4:30 pm. But catching a parade till the end is all worth it. 4) Durgiana Temple :- This is a Durga Mata temple. Also know as the silver Temple due to the silver Doors. 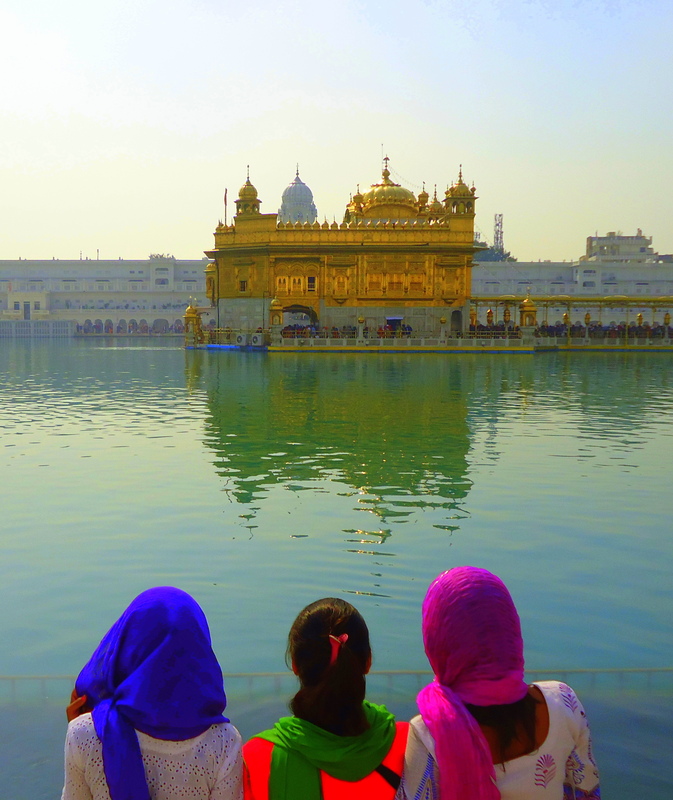 It is described as the Hindu version of the golden Temple. If you have time and want to see another spiritual place this is good. This is also surrounded by a holy water tank. We were lucky to get a beautiful night view of the temple just when the bhajans started. 5) Shopping :- There are some interesting shops opposite to the Golden Temple. From salwar suits to bangles, the bazaars of Amritsar have it all in the old city. One can buy juttis, steel kadas and even dry fruits here. You can go to Amritsar’s Hall bazaar for the best woolens – shawls, sweaters and mufflers. 6) Street food :- Don’t give a miss to the delicious Punjabi delicacies & lassi here. After doing some night shopping and tasting the delicacies of the city we rushed to the railway station where our special train had been waiting for us. 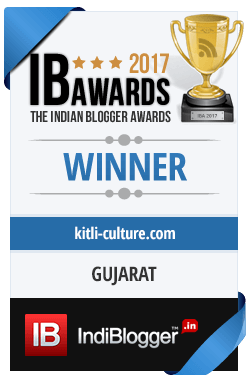 Our next stop was Katra – Vaishno Devi. I hope I will be able to make this trip some day! Yes Amritsar is just so divine!